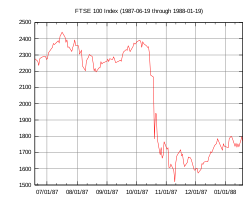 FTSE 100 Index (June 19, 1987, to January 19, 1988). DJIA (June 19, 1987, to January 19, 1988). This article is about the financial event. For television show, see Black Monday (TV series). In finance, Black Monday refers to Monday, October 19, 1987, when stock markets around the world crashed. The crash began in Hong Kong and spread west to Europe, hitting the United States after other markets had already sustained significant declines. The Dow Jones Industrial Average (DJIA) fell exactly 508 points to 1,738.74 (22.61%). In Australia and New Zealand, the 1987 crash is also referred to as "Black Tuesday" because of the time zone difference. The terms Black Monday and Black Tuesday are also respectively applied to October 28 and October 29, 1929, which occurred after Black Thursday on October 24, which started the Stock Market Crash of 1929. In late 1985 and early 1986, the United States economy shifted from a rapid recovery from the early 1980s recession to a slower expansion, resulting in a brief "soft landing" period as the economy slowed and inflation dropped. The stock market advanced significantly, with the Dow peaking in August 1987 at 2,722 points, or 44% over the previous year's closing of 1,895 points. Further financial uncertainty may have resulted from the collapse of OPEC in early 1986, which led to a crude oil price decrease of more than 50% by mid-1986. On October 14, the DJIA dropped 95.46 points (3.8%) (a then record) to 2,412.70, and it fell another 58 points (2.4%) the next day, down over 12% from the August 25 all-time high. On Thursday, October 15, 1987, Iran hit the American-owned (and Liberian-flagged) supertanker, the Sungari, with a Silkworm missile off Kuwait's main Mina Al Ahmadi oil port. The next morning, Iran hit another ship, the U.S.-flagged MV Sea Isle City, with another Silkworm missile. On Friday, October 16, when all the markets in London were unexpectedly closed due to the Great Storm of 1987, the DJIA fell 108.35 points (4.6%) to close at 2,246.74 on record volume. Then–Treasury Secretary James Baker stated concerns about the falling prices. The crash began in Far Eastern markets the morning of October 19 and accelerated in London time, largely because London had closed early on October 16 due to the storm. By 9:30 a.m., the London FTSE100 had fallen over 136 points. Later that morning, two U.S. warships shelled an Iranian oil platform in the Persian Gulf in response to Iran's Silkworm missile attack on the Sea Isle City. By the end of October, stock markets had fallen in Hong Kong (45.5%), Australia (41.8%), Spain (31%), the United Kingdom (26.45%), the United States (22.68%) and Canada (22.5%). New Zealand's market was hit especially hard, falling about 60% from its 1987 peak, and would take several years to recover. The damage to the New Zealand economy was compounded by high exchange rates and the Reserve Bank of New Zealand's refusal to loosen monetary policy in response to the crisis, in contrast to countries such as West Germany, Japan and the United States, whose banks increased short-term liquidity to forestall recession and would experience economic growth in the following 2–3 years. Following the stock market crash, a group of 33 eminent economists from various nations met in Washington, D.C. in December 1987, and collectively predicted that "the next few years could be the most troubled since the 1930s". Possible causes for the decline included program trading, overvaluation, illiquidity and market psychology. A popular explanation for the 1987 crash was computerized selling dictated by portfolio insurance hedges. However, economist Dean Furbush pointed out that the biggest price drops occurred during light trading volume. In program trading, computers execute rapid stock trades based on external inputs, such as the price of related securities. Common strategies implemented by program trading involve an attempt to engage in arbitrage and portfolio insurance strategies. As computer technology became widespread, program trading grew dramatically within Wall Street firms. After the crash, many blamed program trading strategies for blindly selling stocks as markets fell, exacerbating the decline. Some economists theorized that the speculative boom leading up to October was caused by program trading, and that the crash was merely a return to normalcy. Either way, program trading ended up taking the majority of the blame in the public eye for the 1987 stock market crash. U.S. Congressman Edward J. Markey, who had been warning about the possibility of a crash, stated that "Program trading was the principal cause." New York University's Richard Sylla divides the causes into macroeconomic and internal reasons. Macroeconomic causes included international disputes about foreign exchange and interest rates, and fears about inflation. The internal reasons included innovations with index futures and portfolio insurance. I've seen accounts that maybe roughly half the trading on that day was a small number of institutions with portfolio insurance. Big guys were dumping their stock. Also, the futures market in Chicago was even lower than the stock market, and people tried to arbitrage that. The proper strategy was to buy futures in Chicago and sell in the New York cash market. It made it hard – the portfolio insurance people were also trying to sell their stock at the same time. After Black Monday, regulators overhauled trade-clearing protocols to bring uniformity to all prominent market products. They also developed new rules, known as "trading curbs" or colloquially as circuit breakers, allowing exchanges to temporarily halt trading in instances of exceptionally large price declines in some indexes; for instance, the DJIA. ^ Browning, E.S. (2007-10-15). "Exorcising Ghosts of Octobers Past". The Wall Street Journal. Dow Jones & Company. pp. C1–C2. Retrieved 2007-10-15. ^ "Black Monday 10th Anniversary 1987 Timeline". The Motley Fool. 1997-10-19. Archived from the original on 2007-03-06. Retrieved 2007-10-15. ^ "Commercial Framework: Stock exchange, New Zealand Official Yearbook 2000". Statistics New Zealand. Retrieved 8 December 2014. ^ Grant, David Malcolm (1997). Bulls, Bears and Elephants: A History of the New Zealand Stock Exchange. Wellington: Victoria University Press. p. 330. ISBN 0-86473-308-9. Retrieved 18 July 2016. ^ "Setting the Record Straight on the Dow Drop". New York Times. 1987-10-26. ^ Bialik, Carl (2008-10-01). "The Day Stocks Rose but the Dow Plunged". WSJ.com Blogs: The Numbers Guy. ^ "Group of 7, Meet the Group of 33". The New York Times. 1987-12-26. ^ Bookstaber, Richard (2007). A Demon Of Our Own Design. USA: John Wiley & Sons. pp. 7–32. ISBN 978-0-470-39375-8. ^ Albert, Bozzo (2007-10-12). "Players replay the crash". Remembering the Crash of 87. CNBC. Retrieved 2007-10-13. ^ Annelena, Lobb (2007-10-15). "Looking Back at Black Monday:A Discussion With Richard Sylla". The Wall Street Journal Online. Dow Jones & Company. Retrieved 2007-10-15. ^ Bernhardt, Donald; Eckblad, Marshall. "Black Monday: The Stock Market Crash of 1987". Federal Reserve History. Retrieved 31 July 2014. "Brady Report" Presidential Task Force on Market Mechanisms (1988): Report of the Presidential Task Force on Market Mechanisms. Nicholas F. Brady (Chairman), U.S. Government Printing Office. Carlson, Mark (2007) "A Brief History of the 1987 Stock Market Crash with a Discussion of the Federal Reserve Response," Divisions of Research & Statistics and Monetary Affairs Federal Reserve Board, Washington, D.C.
Securities and Exchange Commission (1988): The October 1987 Market Break. Washington: U.S. Securities and Exchange Commission (SEC). Shiller, R. (1989). "Investor Behavior in the October 1987 Stock Market Crash: Survey Evidence". Boston: MIT Press. in Shiller, Robert J. (1990). Market Volatility. MIT Press. ISBN 0-262-19290-X. Robert Sobel Panic on Wall Street: A Classic History of America's Financial Disasters – With a New Exploration of the Crash of 1987 (E P Dutton; Reprint edition, May 1988) ISBN 0-525-48404-3.